Salvation And Survival: Luke 10:19 ... Does "All" Mean All? Luke 10:19 ... Does "All" Mean All? I know that I have referenced this verse many times during my discussion on spiritual warfare. It is a foundational concept that we modern Christians don't really understand, and frankly, don't know how to incorporate into our walk with Christ. I have discussed our Power and Authority through Christ in several blogs. And you can refer to my thoughts on this subject by clicking here , here and here, among others. But today, I want to explore what the Bible says about the power of Satan, and if Jesus really meant that He was giving us [His] authority over ALL the power of the Enemy. In effect, I'm asking this question ... does ALL really mean ALL (the complete, total, and entirety of the devil's power), and what does that power consist of? First, we must understand who our adversary is, and again, Christians cannot entirely agree on how much he [can] control our lives. But this we do know: He is not equal to God. God is All-powerful, Omnipresent, and Omniscient. Satan is none of these. He cannot be present everywhere at once, nor can he know everything, and know it all at once. And most importantly, he does not have the same degree of power that God has. BUT we must acknowledge that he does have power -- Jesus states as much in this verse! But when it comes to this power, how is it conducted against us? And that's where I believe the difference of opinion among Christians leaves some of us vulnerable to that power. It is essential that we come to know our own theology; that we develop a clear Biblical understanding of the nature of God and His cosmic principles, and be able to apply it to our lives in relationship with Him. There are those Christians who will say that the devil has no power without God's permission -- that he cannot tempt you, cause you physical harm, cannot force you to do anything you don't want to, cannot touch you in any way, does not know the future. In other words, anything bad that happens to you is because God allowed it. And, in essence, what they are saying is that all power and authority belong to God, and Satan has no authority over the Believer. And they can site Scripture after Scripture to back up their position. I would agree that all power and authority ultimately belongs to God, but this particular theological position discounts all the Scripture that acknowledges how our free will plays into the power equation. 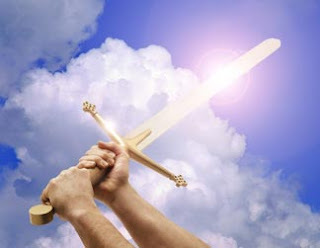 You see, when discussing the Enemy's power, we cannot dismiss that he has access to this realm because man's free will in the Garden, which resulted in rebellion against God's authority, has given Satan the titles of “prince,” “god,” and “ruler” of this world -- all of which denote some degree of power. And he has not abdicated those positions, nor the power that comes with them. Yes, while it is important to recognize that his power is evident on this earth and in the spiritual realm [where his demons reside and should not be underestimated], we know in our spirits that Jesus Christ crushed Satan’s power with His death on the Cross. Yes, “The prince of this world now stands condemned” and Jesus will one day destroy Satan’s power completely and purify His creation. But note: that is one day in the future! Until then, Satan's power is real and he continues to oppress and attack us. But this should not frighten us nor discourage us! Jesus showed us [through his healing miracles of both sicknesses and demonic attacks] that the power of the Father was stronger than any power of the ruler of this world. And do you think that just because Jesus is absent from this earth, that the Enemy has abandoned the field of battle? Furthermore, do you think that Jesus would leave us without the ability to fight back; that He would expect us to suffer until the day and the hour that the Father instructs Him to return to judge Evil and destroy it forever? That simply does not fit the Nature of the God I serve! The only area in which Satan's power is completely broken is over Death. Until the Cross, Satan held the Power of Death and the Fear of Death. But Jesus's Death destroyed that particular power of the devil, and in this arena, the Victory is complete. But we cannot lose sight that Satan has some measure of power he is still allowed, which means that his power is not yet completely broken ... We know that we are from God, and the whole world lies in the power of the evil one (1 John 5:18). He is still able to afflict our flesh, our emotions, our minds, and influence/tempt our free will. I never get tired of quoting Dr. Charles Kraft, who says, "Our churches are filled with wonderfully saved people ... who are afflicted by the devil and need healing; both physical and spiritual". And I can attest to that through the increasing numbers who have found their way to my and my husband's doorstep! It amazes me that they are not even aware that their physical, emotional, and spiritual suffering is in anyway connected to the power of the devil to attack them. So, back to my original question ... when Jesus says He has given us authority over ALL the power of the Enemy, do you believe Him? Or are you too willing to believe Satan's lies that what you are suffering is the will of God; to humble you and bring you closer to Him? Is that the picture of God that you have --- that He would desire you to suffer infirmities; or the emotional and spiritual pain of all manners of abuse; or leave you in a state of continual self-hatred for things you've done [or were done to you]? Because that's NOT what Jesus says here, in Luke 10:19!!! He very clearly tells us that He has given us the authority to overcome every (ALL) power of the Enemy -- the same authority [to use the Divine Power] that God gave Him to defeat evil -- whether they be spirits of Infirmity, Demonic attacks, Physical/Sexual/Emotional Abuse, Self-denial, Unforgiveness, Fear, Anger, Shame, Rejection, Lust, Pride, Rebellion, Unbelief, the Occult ... and the list goes on and on. Jesus came to be our example; we are made in His image, and we are told that it is our mission to become more like Him as we grow to maturity in our faith. When are we going to believe that we can be like Him, and when are we going to begin acting like Him? I can tell you that as the Holy Spirit begins to show you these Truths, there is a freedom and the burden to live in this world becomes lighter. Jesus really meant it when He said His yoke was easier and His burden lighter. I see Him like this ... He came to train us up, like an older, stronger, more experienced Brother who would bear the burden of teaching us spiritual warfare and guide us through learning by His example. Now it's up to us to not only believe Him, but follow in His footsteps ... We have His God-given Authority to deal with Satan's power [and any attack by the Enemy]. We must step out in Faith, knowing that the Power that is in us is greater than the devil's power, and nothing can harm us!